There’s just nothing like the joy of a well-behaved dog firing on all cylinders. 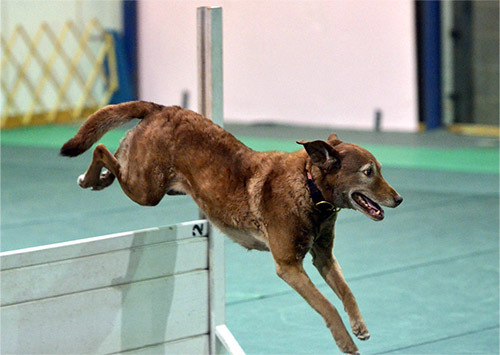 Excellent training produces excellent behavior, and that’s what One Happy Dog is all about. Let’s get you enjoying your dog’s very best behavior—in the ring, on the field or course, at home, and anywhere else you need it. I regularly help owners overcome everything from basic puppy training needs like housetraining to basic adult dog manners to serious issues like aggression and separation anxiety. Whatever your puppy or dog is doing or not doing that’s causing you frustration, stress, or worry, I’d love to help. I can show you how to get the results you’re after, or do the training for you. Either way, we’ll use only positive-based training techniques. Training achieved without pain or fear lasts longer, and feels better, too—for dogs and trainers both. Looking for some heeling help? Have an article problem? Dog missing his jump on your retrieve? Some focused one-on-one time can go a long way toward solving your obedience problems. Or just get ahead faster with private lessons to supplement your class experience. Is your dog coming off of odor? Missing his hides? Struggling with a specific scent? A Nosework private lesson is just the thing. Give your dog a head start or a finishing touch with a training session focused just on you. Sometimes it isn’t practical to train in person. Send me a video of the problem you’re working on—heeling, article work, jumping, missed hides, coming off odor, or whatever’s keeping you from the performance you’re after—and I’ll review it. Then we’ll get on the phone and I’ll share some customized tips to move you to the next level. For your convenience, I come to your home and work with you and your dog together. I’ll assess the situation and create a training plan customized to your goals, and get you and your dog working smoothly together. If you’d prefer, bring your dog to K9 PlayTime for private training. Just as in your home, I’ll devise a customized training plan and teach you how to implement it for best results. Short on time and prefer not to do the training yourself? Board your dog at K9 PlayTime and I’ll do the training for you, visiting her for training sessions throughout her stay. A great way to get results quickly, or take advantage of an already-planned trip.